On lightly floured surface, unroll dough into 1 large rectangle. With floured rolling pin or fingers, roll or press dough into 12x9-inch rectangle, firmly pressing perforations to seal. Spread cream cheese mixture evenly over dough rectangle. With pizza cutter or knife, cut rectangle lengthwise into 2 narrow rectangles. Starting with cut edge, roll up each narrow dough rectangle (filling will be soft). Repeat with remaining half. With serrated knife, cut each roll into 12 slices; place cut side up in muffin cups. Place 1 raspberry over jam on each roll. In 1-cup microwavable measuring cup, microwave chocolate chips and shortening uncovered on High 30 to 45 seconds, stirring once, until melted. 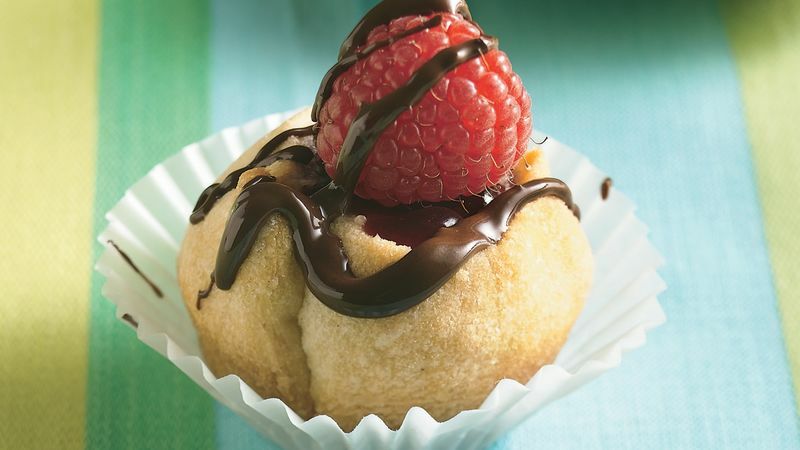 Drizzle chocolate over warm rolls. Serve warm or cool. Store rolls in refrigerator. Substitute your favorite variety of jam and fresh fruit.